A RUP LIFE: A First Look at Diggerland USA! Opening June 14, 2014 in Berlin, NJ!! A First Look at Diggerland USA! Opening June 14, 2014 in Berlin, NJ!! What a fun life I have as a blogger we are really blessed to experience so many great adventures and products. 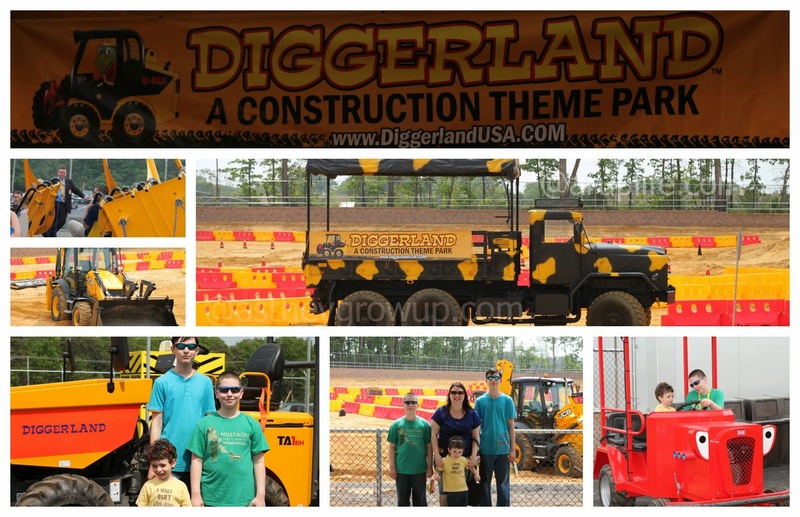 Last week on Thursday, May 22, 2014 my family was invited to the media day for a new construction themed adventure park called Diggerland! Located in Berlin, NJ it is the first of it's kind in the USA! This event started out with a fabulous spread of food and music for the guests. Then the owners and media relations gave a few speeches to talk about this unique project. Next we were free to walk around and see the park up close. A few of the attractions were open and we had the chance to ride. Unfortunately the weather gave us a bit of a hiccup but it didn't really take away from the excitement of the day! The park officially opens June 14, 2014 - so it wasn't quite finished when we were there. (Just the small details like park benches, decorations and the gift shop are still being worked on.) That said they have some AMAZING attractions! I brought my three sons with me (13, 11, 3) and all can't wait to go back when it is opened. From what I saw there will be attractions suited for all ages. My three year old was able to go on the Dig-A-Round and sit in his own seat. He absolutely loved it. From the looks of it he will be able to do a few others with parental help (love that Mom & Dad are included in the fun!). They also have a great playground if your child just likes that sort of thing. I think the most intriguing part is that most of the rides/attractions use real equipment! JCB modified their equipment so that it is specifically designed for this theme park. They also have an awesome arcade and a rock wall. They offer birthday party packages too. I think there is plenty to amuse all ages! I can see this park being the highlight of many little boy's and girl's summers! Additional information: Diggerland USA is a construction themed adventure park where children and their families drive, ride, and operate heavy machinery in a safe family-friendly environment. Diggerland has 4 locations in the UK with a North American park opening publically in the summer of 2014. Diggerland is the most unique amusement experience in the world. Its US location is based in West Berlin, NJ. More information is available online by visiting www.DiggerlandUSA.com. Be sure to visit them on Facebook for additional information! Thank you to Diggerland USA for inviting A Rup Life to this event. Wow! What kid doesn't like construction vehicles??!! Thanks for sharing at Field Trip Friday. Pinning to my East Coast board. We have this on our wish list for the summer - it's only half an hour from us. It looks really, really great! Did your older one enjoy it? I expect my 16yo will be more chaperoning/herding, but my 10 and 13 yos would probably want to play along side my littler ones. and in that post is a link to the site where I wrote the entire review.